Max Verstappen says Red Bull have been "two races behind" Ferrari and Mercedes in 2018 due to Renault delaying upgrades to their power unit. The French marque's works team typically take first delivery of new parts, while Red bull have even turned down some upgrades in 2018. 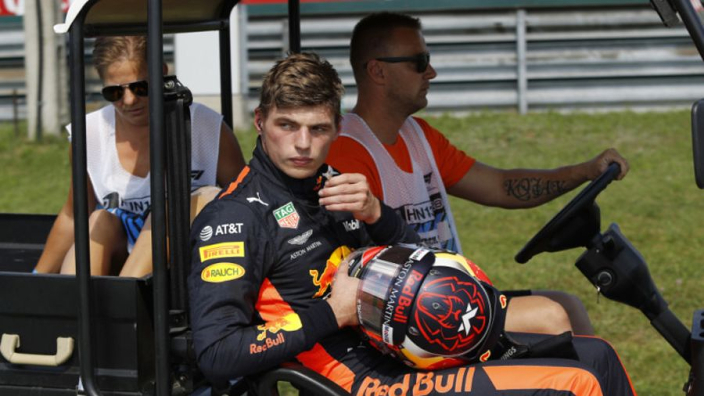 After Verstappen was forced to retire with a failed MGU-K in Hungary before the summer break, Renault boss Cyril Abiteboul revealed that Red Bull had not ran an updated part, which the factory team had not seen fail, since the Monaco Grand Prix. Red Bull head into the summer without a podium finish in the three races since Verstappen's win in Austria. They have also suffered a mechanical DNF in each of those grands prix. Verstappen understands the delay in getting updates to Red Bull, but says it has hampered the team - previously expected to pose a serious challenge in both championships this year. "If there are new parts, they will of course go to the factory team first, which is also logical but it's a pity for us," Verstappen said. "You just know that at Ferrari and Mercedes these are immediately introduced and then they might have advantage of that for one or two races, before the rest takes a step. "So, we are always two races behind. "Especially now [Renault] have their own factory team, you're always a little behind on things. "Now that it's certain that you are making the switch to Honda, that will not work in your favour, let's put it like that. But that's how these things work, and we know that, so you just need to accept it." Frustrations with Renault are nothing new for Red Bull and Verstappen says the team must continue to produce the best car they can despite the power deficit, with a favourable race at Singapore giving them another chance to win before the season is out. "I hope we will continue to develop the car well," he said. "The engine is a difficult story. "We are better than them [Mercedes and Ferrari] in terms of car, so car-wise they are the ones who need to catch up."